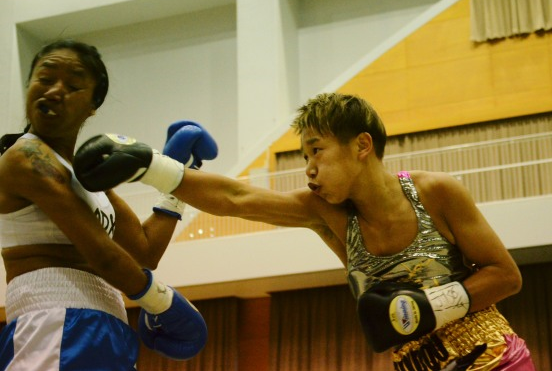 When we think of the top Asian female fighters right now it's fair to say that no one matches Naoko Fujioka, the stand out Asian and one of the top pound-for-pound female fighters on the planet. One of the chasing pack behind Fujioka is Japanese Flyweight Shindo Go (13-2, 8). Go, real name Megumi Hashimoto, showed why she is so highly regarded earlier today as she made the first defense of her WBC Flyweight title. Defending the belt she took from Renata Szebeledi 7 months ago Go made a great start using her boxing skills and aggression to fight off Mexican challenger Judith Rodriguez (6-6, 4). Rodriguez, despite her record, proved to be a fighter unwilling to just lose and she tried to fight back and made life very difficult for Go with her Latino spirit keeping her competitive through the bout despite being behind on the cards. Despite mostly looking in control Go did get stunned at one point as she faced a rare struggle. She managed to see it out and went on to take the unanimous decision by a closer than expected 96-94 scoreline across the board. Whilst the cards did reflect a very close bout it was hard to see anyway in which Go was to lose the bout. She was in control for large portions and even seemed to be robbed of a knockdown early on, a knockdown that would have made the scores very clear on the cards. Thankfully though the right fighter won and few will complain about the result, despite the spirited effort of Rodriguez. On the undercard of a South Korean prospect show there was a victory for Eun-Sun Lee (2-0) who, for the second time in her career, overcame fellow Korean Bo-Ra Kim (0-2). When the women first met, back in March Lee won a shut out over Kim, this time however she really struggled with Kim and only just escaped with a majority decision. Female fighters are often looked down up on in a number of Western countries due to their lack of action and competitiveness. 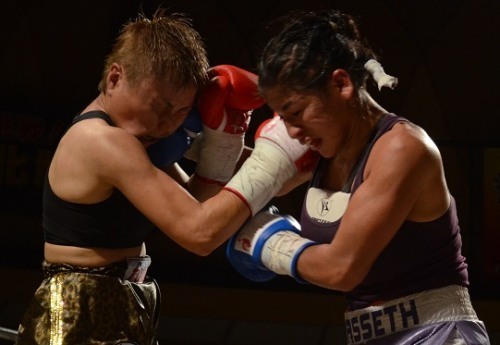 This Saturday however fans in Japan got the chance to see some female boxing at it's absolute best as Mari Ando (11-6, 5) and Jasseth Noriega (16-2-1, 5) put on an absolute war over the WBC Minimumweight title. The WBC title, which had been vacated earlier this year by Naoko Fujioka, may have previously had a dominant champion but this time around we had a competitive bout and one that fans, worldwide should try and get their hands on. Noriega started incredibly fast and her intentions were clear. She was going to try and break down Ando or make sure that she was winning rounds so clearly that the judges were forced to give her them. Through the first 4 rounds it was was clear the Mexican wasn't traveling around the world to just lose. By round 5 the pace was taking it's toll on Noriega and from then on Ando began to come back into the bout. Having shown her trademark toughness the Japanese fighter found the ability to go to the well once again as she began to let loose. Although Ando was beginning to fight back it was an uphill battle for the former WBA Atomweight champion who clearly in a hole at the half way mark. The tenacity of Ando seemed to have done enough to make it close. As we reached the final bell it was obvious neither fighter had managed to dominate the fight but both had made a genuine claim to the world title. Thankfully for Ando fighting at home seemed to sway the judges as she took a very narrow split decision with scores of 96-94, 95-94 in her favour, against a score of 96-92 in favour of Noriega. Had the fight been in Mexico we imagine Noriega would have got the decision proving that home advantage really can be the difference between a win and a loss. For Ando this result sees her just her second win in 5 fights following losses to Ayaka Miyao and Su-Yun Hong. For Noriega however this was her 3rd successive loss.